How sad that a puppy faces death for acting like a puppy. What ever happened to commitment? NOT RESERVED PUPPY BOY WILL BE KILLED SHORTLY. I dont ask for much - a warm blankie to snuggle with, a lap to curl up on, some yummie treats, and stuffies to play with. But most of all I just want to find a new mom and dad to love me. I am a male, chocolate and white Chihuahua - Smooth Coated. Shelter staff think I am about 1 year old. I have been at the shelter since Apr 17, 2018. Fidonation, if you or someone you know is interested in giving this pup the forever family he rightfully deserves, please contact the San Bernardino City Animal Shelter at (909) 384-1304, and reference the shelter ID #A513253. 3 Responses to "Terrified! 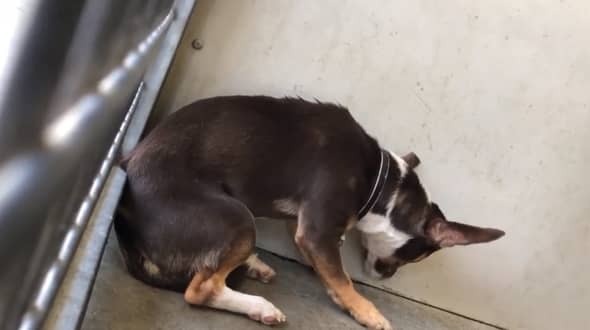 not moving and shaking in corner all day, 1 year old Chi has no idea he is about to die"
His number isn't on the petfinder under San Bernadino,and there are a lot of dogs who have been there longer so my guess is that he was adopted or rescued.